Prime Minister Imran Khan will have to stay in power a long, long, long time if he wants to see the Diamer Bhasha and Mohmand dams built. He will need more than overseas Pakistanis to get the Rs1,450 billion needed. So far, just Rs2 billion has been collected since the fund was created by the chief justice on July 6. That is 0.1% of the target. PM Imran Khan made the call for donations two months after the fund opened, on Friday Sept 7. By the next morning, #DamsForPakistan, #DonateForDams, #DamFund were trending on Twitter with people sharing tips on how to donate. Some people even posted evidence of their contributions, asking others to do their “national duty”. He wants Pakistanis living abroad to especially send at least 1,000 dollars each. Critics say that crowdsourcing a mammoth infrastructure project is not how governments are run. Some even demanded the PM sell his lucrative Bani Gala mansion to donate for the dams. Others suggested he pay for the dams by getting back the “$200 billion” stashed away in Swiss banks that his party has been quite vocal about. Others argue against building the dams in the first place. Why do we need the dams? Pakistan is close to be a water-scarce country. It may run dry by 2025, according to the Pakistan Council of Research in Water Resources. This means that if we don’t conserve water, we may have a drought. There will not be enough water to drink, forget about growing crops and making products in factories. A shortage of water will be a disaster for the economy. To store water, we need to build the dams. Since the provinces were divided over Kalabagh Dam, the government has decided to build Diamer Bhasha and Mohmand Dams, which have political consensus. How much do we have so far? As of September 8, the fund had received Rs2 billion in donations. It needs another Rs1,448 billion. PM Imran Khan has said he will get the money in five years. You can monitor in real time how much has been collected by visiting the Supreme Court’s website. If you are in Pakistan: You can pay at the counter of any branch of any bank across Pakistan. You can pay through ATMs or online banking, using the IBAN (account number) of the PM-CJ Fund. You can see this number on your bank’s website and on your ATM screens. You can contribute through your mobile phone by sending an SMS to 0800. Each SMS will result in a donation of Rs10. You can pay in cash at branchless banking agents of banks such as UBL Omni. You will receive an SMS alert confirming your donation. If you are outside Pakistan: You can submit donations at Pakistani consulates and embassies. You can ask your bank (foreign bank where you have your account) to remit your donations to the State Bank of Pakistan. The details you need can be found in a circular available on the SBP’s home page. Given the seriousness of the matter, one must appreciate the intentions of both the CJ and the PM as well as laud the efforts of Pakistanis at home and abroad for their generous contributions. However, there appears to be some disagreement over how the project is being funded and whether building a huge dam is the only solution. One argument against the PM-CJ fund: the government can raise only Rs60 billion in five years at the current pace, Rs33 million per day. Even this is doubtful because the momentum created by the PM’s call will not last long. In other words, this fund could meet the same fate as the “qarz utaro mulk sanwaro” program by Nawaz Sharif or the ‘President’s Relief Fund’ by General Pervez Musharraf. The second argument is not against the fund as such, but the dam itself. Hassan Abbas, an expert in water resources, argues that Pakistan does not need a mega dam, but mega vision. He says we have enough water in our natural system and global warming will result in more rainfall and an increase in the water supply. Abbas says our system has 145 million acre feet (MAF) of water per year. Agriculture needs 50 MAF, industry needs 10 MAF while household consumption is 17 MAF. We have twice as much water as we need – there is one problem though, a bulk of it is available in the monsoon only. Dams will not solve any of these three problems. Plus, they are expensive, environmentally destructive, and their construction takes years. Besides this, they have a limited life because they silt up. Do critics have a solution? Abbas says we need dam-equivalents. Unlike a huge dam, these are small interventions in a water system and do the same thing as a big dam. However, they don’t have the same disadvantages as big dams. Abbas says our 3,500-kilometer river network has 42 canals, which consume 95% of our water. Dam-equivalents can be set up at each of these canals. He says the first intervention can divert water to farmers with modern irrigation methods. He gives the example of a dam-equivalent in Rohri Canal, which draws 8.5 MAF from the Indus River. This will reduce waste and spare water. 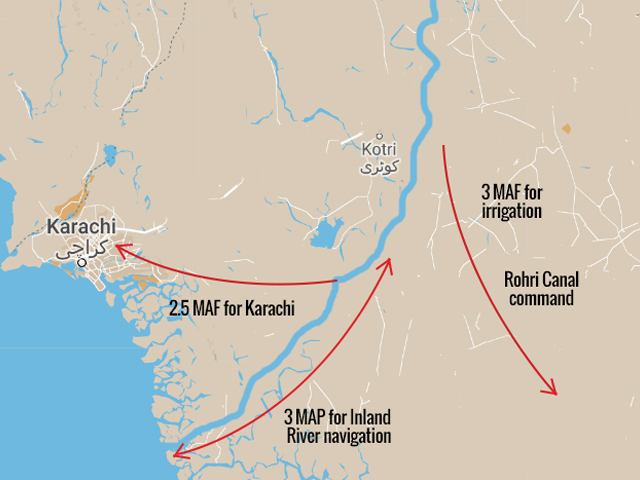 The second intervention can divert some of this spared water to Karachi. The third intervention will create a navigation channel between Kotri and the open sea, which can help people earn a living. Dam equivalents are cheaper and more sustainable than big dams. They are faster to build and pay back more. The Rohri Canal alone has the potential to earn $36 billion, nearly 12 times what Kalabagh Dam would have earned, he said referring to a study.